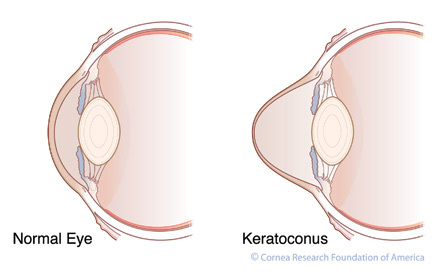 The word keratoconus is derived from two Greek words: kerato, meaning cornea, and konos, meaning cone. Keratoconus, is a condition in which the normally round shape of the cornea is distorted and a cone-like bulge develops, resulting in significant visual impairment. This corneal change usually begins in the late teens or early twenties and progresses over time. As the keratoconus progresses, the cornea bulges and thins, becoming irregular and sometimes forming scars. 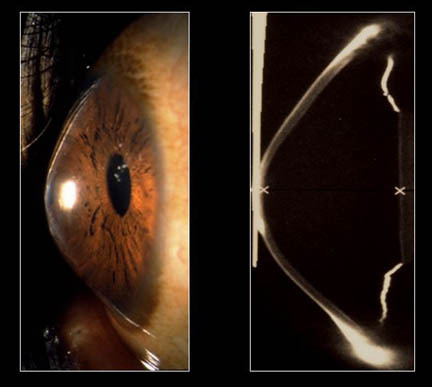 The end result of this progression can range from a minimal visual disturbance that can be corrected with glasses or contact lenses to severe corneal changes that necessitate a cornea transplant to improve vision. A new FDA approved treatment called Corneal Cross-linking can slow the progression of keratoconus in some patients.